With the introduction of the E36 M3, BMW refocused the model's position in the marketplace, going from boy racer to gentleman GT. Today's Nice Price or Crack Pipe M3 is presently owned by a gentleman Jalop, but don't let that stop you from letting this Bimmer boss know whether his pricing is worthy of a gentleman's agreement. Yesterday's custom Cadillac wagon may have been a mix of all things iconic about the early seventies - a jumble of the largest factory wagon this side of a Checker Aerobus and the gravitas that only a large Cadillac - or possibly a Lincoln - could bring. Unfortunately for the dealer selling that yellow behemoth, not even the combination of those factors aded up to making the nearly eighteen grand asking price worth it, at least to the 62% of you who voted it down in a humbling Crack Pipe loss. Elvis once owned a custom Caddy wagon like yesterday's car, and while today's 1995 M3 Coupe isn't owned by anyone quite so famous, it is owned by one of our own, so show a little decorum when you crap all over his car and price weigh in on its desirability and value. Unlike the loud and proud E30 edition of the M3, the E36 car offers few visual cues as to its upper-tier sporting nature. That was a conscious decision by the BMW engineers and is perhaps why today there exists a far greater following for the earlier, less competent - but more viscerally engaging E30 cars. This red over black coupe sports just 118,000 miles on its clock, put there by two previous owners and the current seller. Offered up on the Roundelgasm known to the reverent as the BimmerForums, the car comes with a pretty thorough description of its current state, as well as the sale posting's raison d'etre. The seller, whose BF handle is the mucho macho Mountain Man, notes that the car comes with a clean title and almost equally clean bodywork and interior. He admits to there being a few minor blemishes here and there - as you might expect from a car of this age - as well as a crease in the curb-side, which was the result of a shopping cart attack. Lurking behind the heavily tinted windows, the interior is clean, stock, and for the most part intact - suffering only from the typical bolster rash on the driver's seat door-side, and a headliner that's said to be drooping like a day-old diaper. Mechanically, things are looking up as the car comes with a cat-back pooter upgrade, a new clutch, recent TMS brake upgrades, and a rebuilt Z3 short shifter for its 5-speed. The engine - 2,990-cc S50 straight six which put out 240-bhp from the factory - also has received fresh fluids and a new water pump to move some of those around. The E36 M3 has always stood in the shadow of its fat-fendered and be-winged predecessor, despite being more competent in pretty much every category. As E30 cars are becoming more dear, perhaps it's the E36's day to step into the light? And it's now time for you to vote the fate of a fellow Jalop and determine if Mountain Man's $9,600 price tag is a bright idea. 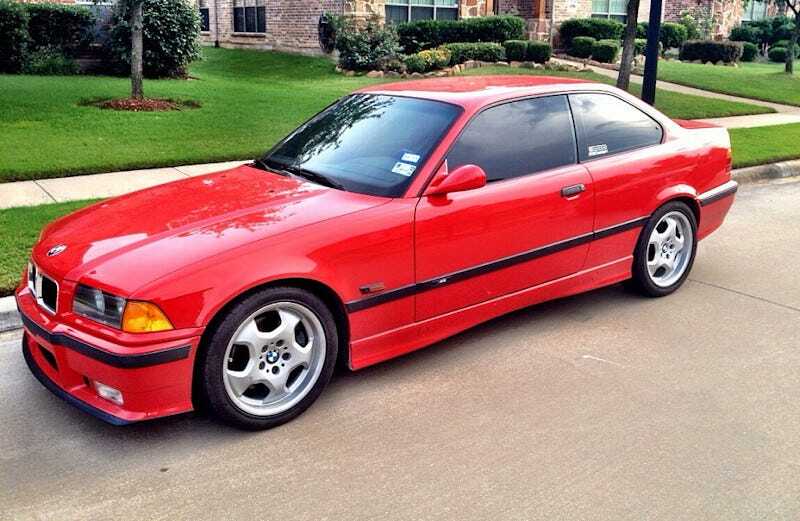 What's your take on this tidy tarmac twister - is this M3 worth $9,600? Or, do you think Mountain Man totally needs to climb down in price? Bimmerforums or go here if the ad disappears. H/T to Mountain Man - who's also the seller - for the hookup!